EU criticizes Israel for closing Kerem Shalom crossing to Gaza, which was closed due to the continued arson terror. The European Union on Friday blasted Israel for closing the Kerem Shalom crossing to Gaza for non-humanitarian cases and demanded that Israel reverse the decision. On Monday, Prime Minister Binyamin Netanyahu and Defense Minister Avigdor Liberman announced that the Kerem Shalom crossing would be temporarily closed. The decision was made in response to the continued arson terror perpetrated by Gazan terrorists using incendiary kites and balloons sent from Gaza into Israeli territory, as well as other attempts at terror attacks. “The Israeli decision to close the Kerem Shalom crossing point, except for humanitarian supplies, and to restrict the fishing zone for Palestinians risks further aggravating the already dire economic situation in Gaza,” said a statement by the EU spokesperson on Friday. “The EU expects Israel to reverse these decisions,” it added. “The European Union fully joins and supports current efforts by the UN and other partners to reduce tensions, upkeep intra-Palestinian reconciliation and improve the humanitarian and economic situation in Gaza. This must be the focus of all sides now,” it concluded. On Tuesday, the UN’s Middle East envoy expressed concern over Israel’s decision to close the Kerem Shalom crossing and urged Israel to reverse the decision. “Humanitarian assistance is no substitute for commerce and trade. I urge the authorities to reverse this decision,” said the envoy, Nickolay Mladenov. 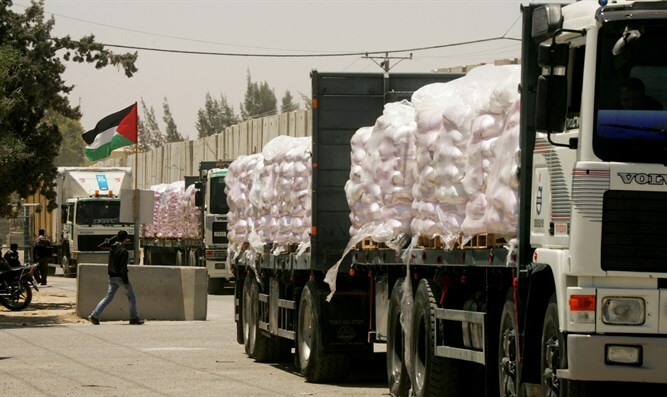 Hamas has reacted to the closure by banning fruit imports from Israel and essentially punishing the residents of Gaza.